From the ZIC Photograph Archives. Do You Recognize These Faces? One of the treasures of the Zohrab Center is its rich collection of historical photographs, some of them from 19th century Armenian communities in western Armenia and the Middle East, many of them documenting the early history of the Armenian community in the United States. The collection, numbering hundreds of photographs, has grown gradually thanks to the donations of American Armenians going back to the establishment of the Diocese of the Armenian Church over a century ago. One person working with the ZIC collection is Dr. Joseph Malikian, an expert in 19th and early 20th century Armenian photography and photographers, who has his own vast and precious personal collection of historical photographs, and who published the recent album, The Armenians in the Ottoman Empire: An Anthology and a Photo History (Antelias, Lebanon, 2011). (Read about a recent exhibit from his personal collection of Ottoman-era photographs). Dr. Malikian recently brought to our attention one of the rare photographs that contains identifying information. Ագ-Շէհիրի դպրոցի բարձրագոյն կարգի աշակերտները իրենց տնօրէնը Լեւոն Աղապապեան, Գարեգին Սրբազանը՝ ներկայիս Պօլսոյ պատրիարք Խաչատուրեանը, Արմենակ Օրմանեան։ 1913-1955. 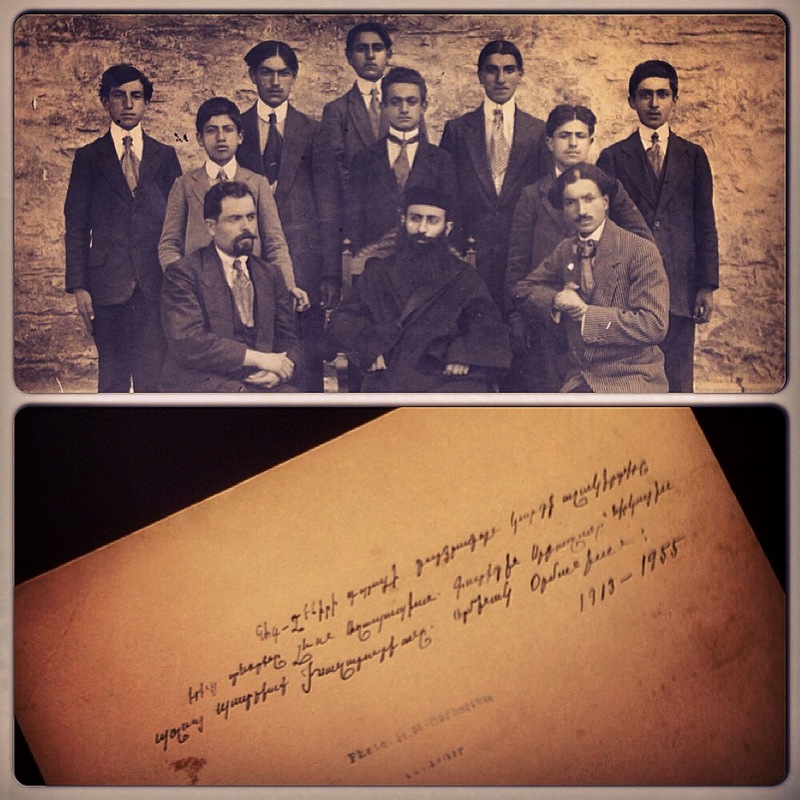 The students of the senior class of the Ak-Shehir school [with] their principal, Levon Aghababian, Bishop Karekin Khachadourian—currently the Patriarch of Constantinople, [and] Armenak Ormanian. 1913-1955. Relatively few of the ZIC photographs include identifying captions such as this one. The fascinating photo and caption provide a glimpse into a long-forgotten page in the story of the Armenian people. Ak-Shehir is a city in west-central Turkey that had a small, but vibrant Armenian community far from the larger pre-Genocide Armenian centers hundreds of miles farther east. Patriarch Karekin Khachadourian, a native of Trabizon, served as Patriarch of Constantinople from 1951-1961. The years “1913-1955” that conclude the caption probably indicate the date of the photograph (1913) and the date that the caption was written (1955). But who is Levon Aghababian, the principal? And who is Armenak Ormanian? Is the latter a relative of Maghakia Ormanian, the great intellectual and prolific scholar who converted from the Armenian Catholic Church eventually to become Patriarch of Constantinople in 1896? If you can provide any additional information about these individuals, the photograph, or the Armenian community of Ak-Shehir, please post a note on this blog. The following has been translated from S.M. Dzotsigian’s massive ethnographic book, Արեւմտահայ աշխարհ [The Western Armenian World], published in 1947 in New York. Ak Shehir [Akşehir] is a city built near the Lake of Konya [Akşehir Gölü]. In ancient times it was sometimes referred to as “Antioch” or “Philomen.” … Near Ak Shehir Emperor Frederick [Barbarossa] was defeated by the Seljuks in the 12th century. And in the 15th century, the Turkish Sultan Bayezid [I, “the Thunderbolt”] died after being taken captive by Timur Lang. Sometime later the Turks again conquered the city. The population of Ak Shehir is 15,000, comprising Turks, Greeks and Armenians. The city produces opium, bronze, animal hides, carpets and other products. Formerly the Armenians in Ak Shehir numbered nearly 3000. Their situation was quite good. They had a church and a school. At the time of the deportations in 1915, no Armenian remained in Ak Shehir. Later a few hundred Armenians returned and took up residence in the city. One well-known native of Ak Shehir is Hagop Topsakaryan [Յակոբ Թօփսաքարեան], who ran the government’s General Prosecutor’s office and then became an advisory member of the National Judicial Ministry. He died in America in 1940. Do you know Hagop Topsakaryan? Are you a relative? Post a comment and help us identify him.